Weigh out that amount of sugar and baking margarine. Weigh out 3 quarters of that amount of self raising flour and 1 quarter cocoa. I go for the all in one method of mixing because, quite frankly, I am lazy. This mix made 20 cakes and I baked them at 180° for 16 minutes. The icing is made using the very technical ‘guessy’ method. I put some baking margarine in a bowl, added icing sugar, a tiny amount of gel food colouring and some peppermint essence and mixed, adding more sugar and a dash of milk until it was the right consistency. I then piped the icing (badly) on top of the cakes and played a fab game of icing roulette. This time every cake got icing, other times I’m not so lucky! 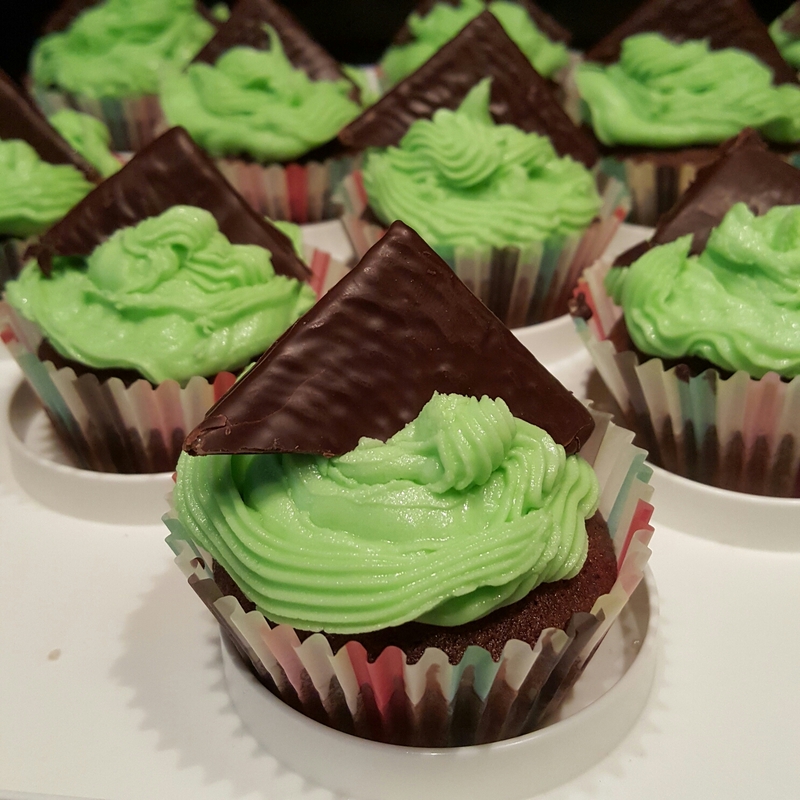 They were topped off with halved after eight mints and left to set. I’m what many would call a haphazard baker, but they have got the Mr Craft seal of approval so we will send them in to school in the morning! Thank you, I can confirm that they are fairly yummy as I had one of the ones that looked a bit too rubbish to go to school! May I fill out an application to be on the “quality control team”, please?!!! These look yummy, Mrs. Craft! Kudos for getting the icing on all the cupcakes 😀 That’s sometimes the hardest part! They really do look yummy. Thank you, they were worth the effort. Hoping they went down well at the coffee morning! We’ve just discovered these mints and I like the idea of using them for decoration! I shall consider the application seriously, although I must make you aware there is a lot of demand for this position. They look great! Not heard of the ‘guessy’ method before. Is it French? Escoffier?! Wow they look lovely! I am drooling! Haha, they caused a bit of a stir in our house too! Ooh my goodness, MrsCraft… they look good!! !